Peel off papery layers and trim out root end. Cut onion in quarters. Toss with oil, salt and pepper. Place cut-side down on a baking sheet. Roast until tender, about 20-25 minutes. To make clean-up easy, cover the baking sheet with foil. 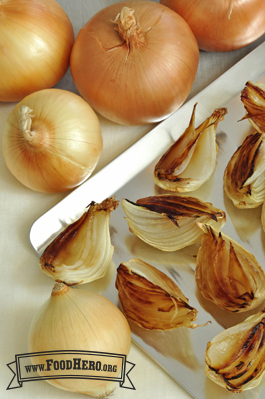 Drizzle with 1 to 2 teaspoons of balsamic vinegar before serving for a different flavor.